GTA Home Savvy Real Estate Serving Toronto, Oshawa, Markham and southern Ontario. GTAHomeSavvy.com - Serving Durham, Halton, Peel, Toronto, and York Regions. Welcome to GTAHomeSavvy.com a top-ranked real estate and MLS® property search of southern Ontario and the regions of Durham, Halton, Peel, Toronto, and York, their municipalities, and their specific communities. We, at the Home Savvy Real Estate Team, created this user-friendly real estate website with you, the customer, in mind. Like most people, your home is the #1 financial asset you will own throughout your lifetime; therefore we believe it is crucial to help educate you, with information, data, statistics, and our professional experiences, so you can make the right decisions to benefit your family. We chose to be in the real estate business to serve. That is the Home Savvy way. 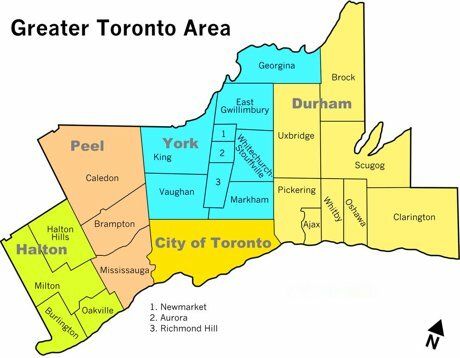 You are interested in properties listed in the southern Ontario regions of Durham, Halton, Peel, Toronto, and York. You may be considering the purchase of real estate in the next 24 months. You like lots of up-to-date property information, including street addresses, pictures, maps, virtual tours, and more. You want a website that is responsive, reliable, and quick-loading (i.e. no waiting). Your questions are answered quickly and thoroughly from full-time, professional REALTORS®. Professionalism, morality, and ethics matter to you.